“We want to be in by Christmas” is a much repeated phrase for people undergoing renovations or new-builds, but for many residents in the Bay of Plenty town of Edgecumbe it held extra meaning this summer. When the Rangitaiki River breached a stopbank in Edgecumbe after the tail-end of Cyclone Debbie struck New Zealand in April 2017, the floods forced the evacuation of the whole town and swept away or damaged more than 250 homes. Nearly a year on and Heather and Phil Mackie, Harrisons Carpet franchise owners for Coastal Bay of Plenty, have played a role in getting more than a dozen households back into their homes – in most cases ensuring the families could spend their first Christmas after the floods in their newly repaired and refurbished surroundings. 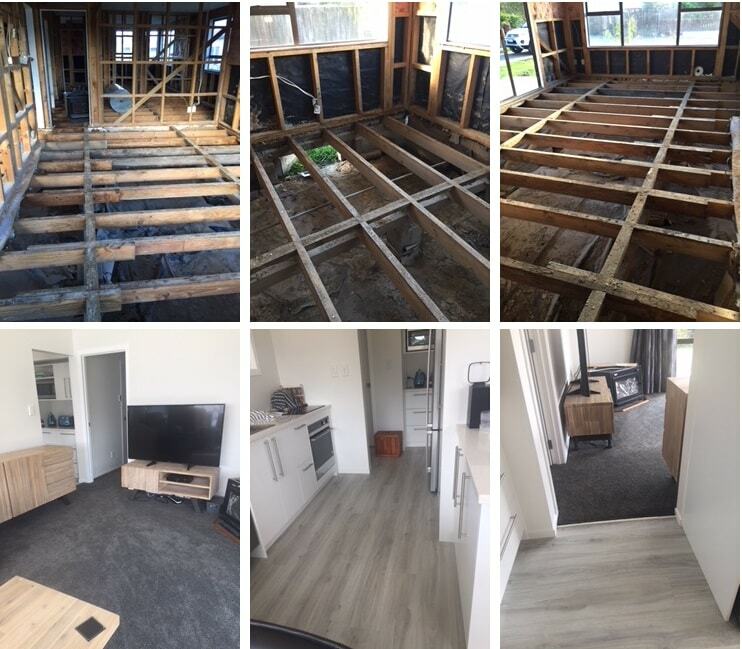 One of Heather’s sister’s neighbours in Te Toki Place, the Newtons, are a good example of the work Harrisons Carpet performed to help restore the battered town. Heather says she was contacted in May to measure and quote on the work while the family was living elsewhere in rented accommodation, and then it was a matter of keeping in contact with the insurance company, assessors, builders and tradesmen involved in piecing the home back together. “Every time I went to Edgecumbe, I’d catch up with all of my properties where we had work to do,” she said. “It was a matter of keeping good lines of communication open with all the parties involved so we could keep all our ducks in a row around timings and the project. “Since people and families like the Newtons were in a stressful situation, it was important to keep a handle on all that was going on because we were all reliant on the insurance companies, builders, painters, sparkies and plumbers – so in many ways it was our role to make sure it wasn’t an issue for them and to make the process as easy as possible. For the Newtons, the final weeks of the nearly eight-month process was additionally stressful because they had to move out of their rental accommodation and were living on the property in a loaned caravan next to their home. That extra attention to managing the project and ensuring the smooth flow of work until the carpet and vinyl went down certainly paid off for the Newtons. After enjoying Christmas together in their own home, they contacted Heather and Phil to thank them for their work. “After the devastation we suffered from the Edgecumbe floods it was fantastic to get back into our home again just in time for Christmas,” they said. “It’s great to have our home back looking fresh, new and better than ever. We want to thank the Harrison’s Coastal BOP team for all their help and advice in selecting our fabulous new flooring. Heather said it was important for her and the Harrisons Carpet team to show that level of understanding for the people of Edgecumbe.